The fastest triathlete is the one who finishes the race with the best combined time of swim, bike, and run plus transitions- no prizes are awarded to who has the fastest bike or swim. Triathlon is especially challenging since you are training for three distinct sports, each with different demands on the body. At the ITU level, the most successful are those who are highly proficient in all three disciplines. In fact, some athletes have relatively close performances to single sport athletes. Contrast that to age group triathletes who will have either one or two preferred sports or one that they “make” it through. When preparing for this multi-faceted event you have to spread a fairly complex workload throughout the week. Since physical progress is based upon overload, recovery, and compensation, the goal is to achieve a balance through a weekly, monthly, and yearly cycle. Training for any sport is more than just the physical activity itself. Besides speed, power, and endurance, there is skill acquisition or reinforcement along with the neuromuscular training where the body adapts to a repetitive motion – the goal is to make this as automatic as possible with proper posture, form and technique. When you throw three quite disparate activities together, each with different motions, athletes often gravitate to the path of least resistance- which can lead to poor form or technique. An effective way to improve overall performance is to take some time to focus training volume and intensity on one sport, particularly the one that needs the most work. Another benefit of a single sport focus is to stimulate the brain in a different way, making the block seem fresher than a basic three bikes, three swims, and three runs per week. Spending time on a single sport will reinforce how that sport should feel and give you confidence in what you are able to accomplish. As a coach, I have found that even two weeks within the final month leading up to a goal triathlon race has benefits. I call this a Boost Phase. Even more effective is an Emphasis Phase. During this time you dedicate three months outside of the Competition Phase towards improving a discipline. Winter is prime time to do this. This longer time frame will provide a much greater opportunity for performance increases and adaptation. With the narrowing of focus it is recommended to have a goal event to train for and test yourself at the end. For swimming it could be a Masters meet. Cycling could finish with a Gran Fondo or regional time trial championship. If you are focused on running, a half marathon could be your goal. If your goal is to improve run threshold speed by increasing the volume and intensity of running, you can achieve significant breakthroughs and close the gap to their dominant discipline. However, the body can only handle so much. If you are going to add two extra run workouts per week then you also need to reduce bike and swim volume. Drop one workout per week of each of those sports. You may also want to reduce intensity somewhat in your non-focus sports to allow full recovery between runs since this is the focus. For a two week Boost Phase, the frequency, intensity, and freshness going into each workout will result in some small gains as well as some confidence in speed. It is a good opportunity to refresh one part of your game which may have been slipping. Within the three month Emphasis Phase, the first four weeks should concentrate on increasing base mileage. Improving endurance and including sport specific strength, such as hills at lower intensity for running and cycling, and pull sets for more quality yardage for swimming. Keeping good form is the goal in this period. Month two should gradually shift to more work at threshold by adding another high intensity workout per week. The goal of these threshold sessions is not to “hit it out of the park”, but to progressively increase the speed you are capable of. For running, start pace work targeting goal half marathon pace, such as 6 to 8 x 1 mile with 1 to 1.5 minute rest. You can use power targets for cycling, and pace per 100 for swimming. Increasing your speed over the course of this month is the goal. For example, in running mile repeats, aim for a speed increase of 5 to 8 seconds per mile throughout compared to your previous standard. While increasing speed, also focus on the technical details. This would include keeping your upper body relaxed on the run, having a smooth pedal stroke on the bike, and maintaining good technique in the pool. During the first two months you should increase the amount of drill work. Finally, in this threshold phase add one or two races shorter races. A 5 to 10k run, 40k time trial, or 1500m swim will test you and give accurate feedback as to your progression and help to refine your single sport skills. As you go into month three, use this time to work on maximum speed with intervals sessions incorporating a 1:1 work to rest ratio. Allow yourself a little more rest in your overall weekly plan. Mile paces should increase a further 5 to 8 seconds, power should increase by 5 to 10 watts, and pace in the pool should increase by 2 to 3 seconds/100m. 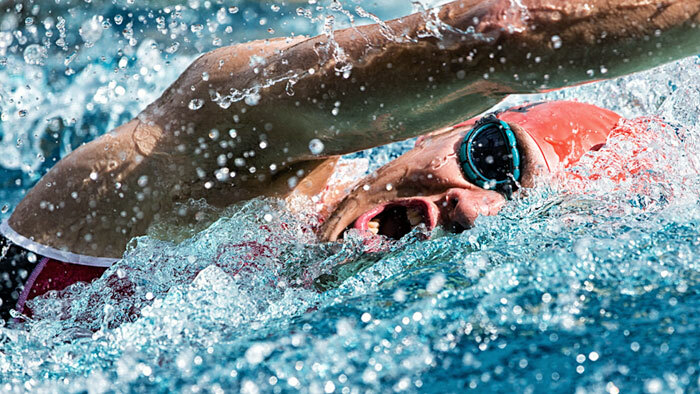 Finish off with the final week of taper before your goal competition. The change in seasons is another reason to include a single sport emphasis. In the northern hemisphere, the days get shorter and colder often precluding longer bike rides after work. With the cooler temperatures, running races again become more prevalent as do Masters swim competitions. If you wish to improve bike handling and power, cyclocross has become very popular as of late. This sport is very high intensity and requires razor sharp bike handling skills. Last, a focus phase could be because of injury. Leg or foot injuries will usually limit the amount of time dedicated to running or cycling, so use this as an opportunity to become a better swimmer. One of the great things about being a multisport athlete is there are always other sport elements to train for. Whatever the reason, switching from a balanced three sport training regimen to one that has a single sport emphasis can result in a solid overall performance improvement.